East Valley Martial Arts would be happy to host a party for your special day! Two fun filled hours with 2 karate birthday hosts in our large indoor facility. & Karate demonstration during cake time! A 50% non-refundable advance deposit is required to reserve day and time with balance due the day of the party. 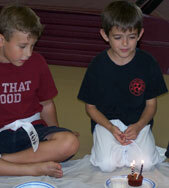 Call now to learn more about our Karate Parties!